Naga is the Sanskrit and Pali word for a deity or class of entity or being, taking the form of a very great snake - specifically the king cobra, a specific type of snake (hooded snake), found in Hinduism, Buddhism, and Jainism. In the great epic Mahabharata, the depiction of nagas tends toward the negative. An epic calls them "persecutors of all creatures", and tells us "the snakes were of virulent poison, great prowess and excess of strength." The great epic frequently characterizes nagas as being able to change form, having a mixture of human and serpent-like traits. Stories involving the nagas are still very much a part of contemporary cultural traditions in predominantly Hindu regions of Asia (India, Nepal, and Bali). In southern India, nagas are considered nature spirits and the protectors of springs, wells and rivers. They bring rain, and thus fertility, but are also thought to bring disasters such as floods and drought. Objects of great reverence, expensive and grand rituals are conducted in communities where the inhabitants consider themselves genetic descendants of Nagas. 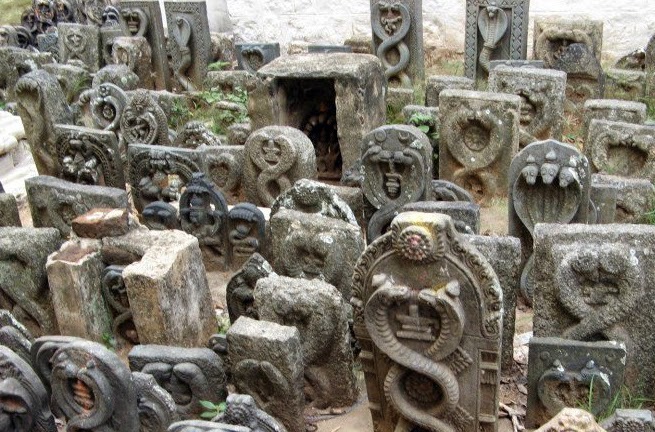 The Nairs of Kerala and the ethnically related Tulu Bunts of Karnataka are clans which are believed to have originated from the serpent dynasty. Vishnu is originally portrayed sheltered or reclining by a giant snake, but the iconography has been extended to other deities as well. The serpent is common in Ganesha iconography appearing: around the neck, as a belt, held in a hand, coiled at the ankles, or as a throne. Shiva is often shown with a snake. Traditions about nagas are also very common in all the Buddhist countries of Asia. In many countries, the naga concept has been merged with local traditions of great and wise serpents or dragons. In Tibet, the naga was said to dwell in lakes or underground streams and guard treasure. In China, the naga was equated with the dragon. The Buddhist naga generally has the form of a great cobra-like snake, usually with a single head but sometimes with many. At least some of the nagas are capable of using magic powers to transform themselves into a human semblance, sometimes portrayed as a human being with a snake or dragon extending over his head in Buddhist paintings. They are believed to live in various parts of the human-inhabited earth, primarily dwelling in deep underground caverns. For Malay sailors, nagas are a type of dragon with many heads; in Thailand and Java, the naga is a wealthy underworld deity. In Laos they are usually considered sea-faring, or water serpents. In Javanese culture, a Naga is a crowned giant magical serpent, sometimes winged. In a Cambodian legend, the naga were a noble reptilian race of beings who possessed a large empire or kingdom in the Pacific Ocean region. The Naga King's daughter married an Aryan and from their union sprang the Cambodian people. Therefore still Cambodians say that they are "Born from Naga". 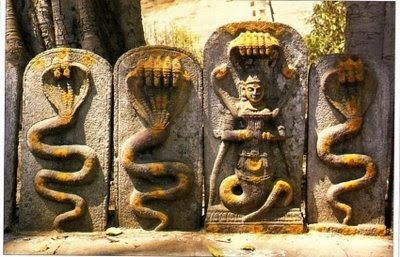 The Seven-Headed Naga serpents depicted as statues on Cambodian temples, such as Angkor Wat, represent the seven races within Naga society, which has a mythological, or symbolic, association with "seven colors of the rainbow". 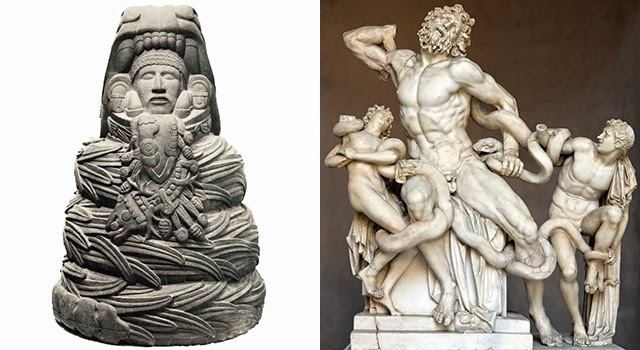 The power of the serpent and this age-old battle is demonstrated below (right) in this ancient Greek sculpture, 'Laocoön and His Sons'. Unfortunately, the epic poem that goes with it did not survive. To the left is a stone depiction of Quetzalcoatl, the venerated Mesoamerican (Aztec) feathered serpent deity of learning and knowledge. Ever read the Nag Hammadi texts that were recently found in Turkey.. puts an awful lot of light on these serpent beings.. The Cambodian legend sounds like a reference to ancient Lemuria, aka pre-Atlantis.